Used to help induce relaxation, relieve pain and reduce discomfort. Deep tissue work is beneficial for athletes to train at optimal performance, and helps people recover from discomfort felt deep within the muscles. The primary goal of pregnancy massage can increase general comfort by reducing swelling of feet and hands, decreasing muscle spasms and cramps, aiding in postural improvement, and increasing circulation. Infant massage helps your baby establish mind and body connection, and also improves the bond between baby and parent. The parent will also be taught simple massage techniques to treat the baby. 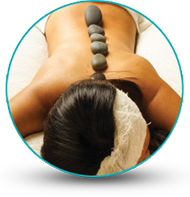 This therapy uses Basalt stones which are natural stones formed as lava cools. All the earth's elements go into creating these healing stones. They have a magnetic field, helping to re-balance your energy centres and promote grounding. Ashiatsu is an ancient and therapeutic form of barefoot massage. Swedish or therapeutic deep tissue techniques leave the client feeling incredibly relaxed. Stress stifles the immune system, leads to illness, and diminishes the body's ability to heal itself and prevent injury. A massage therapist can help induce relaxation, and in doing so, helps the body to carry out its normal functions by releasing toxins and increasing blood flow to vital organs. Touch has an amazing effect on others, both psychologically and physically. Not only can massage decrease pain and discomfort, depression and anxiety can be reduced too. 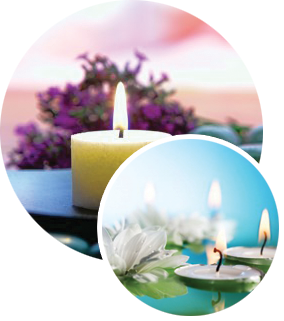 Massage is a non-invasive and natural approach to healing. Clients report improvements in physical function, range of motion and flexibility, as well as decreases in pain and discomfort through regular treatment and application of remedial exercise. © Copyright 2017 Heather Seamone Registered Massage Therapy. All Rights Reserved.